VRBO customer reviews and complaints on PissedConsumer reveal a number of issues about the company. The most common VRBO complaints are in regards to the VRBO cancellation policy, VRBO refunds policy, wrongful advertising of properties, property owners canceling reservations without explanation, how to contact VRBO by phone, VRBO vs. Airbnb, and whether there have been cases of VRBO scams among others. How can I contact VRBO customer service? Are VRBO and HomeAway the same thing? What is the difference between VRBO and Airbnb? We then went ahead to seek answers to the top VRBO consumer questions from the company’s website. 1. How can I contact VRBO customer service? PissedConsumer lists a VRBO toll-free number, sales department phone number, email address, and a link to the VRBO website that you can use to reach out to VRBO customer care. You can also get in touch with VRBO customer support through the HomeAway help page under the contact us button at the bottom of the page. On the page, you will be required to provide information on whether you are a traveler, a property owner, or a manager. You will also be required to choose from the provided categories the best one that describes your issue. Depending on the issue, you will be provided with a VRBO phone number to call or an FAQ that responds to the issue. VRBO notes that their customer support is available 24/7 in different languages to offer travelers, owners and property managers assistance, any time they need it. 2. Are VRBO and HomeAway the same thing? 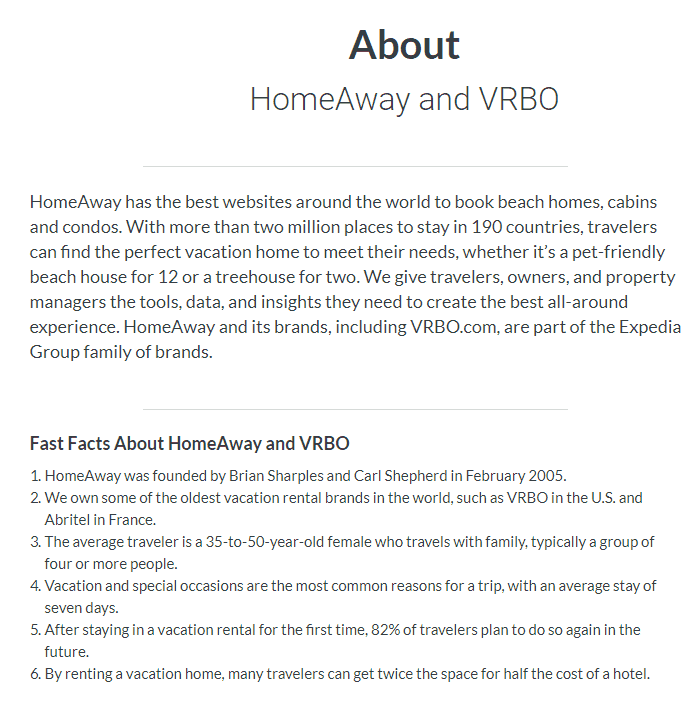 According to the HomeAway website, VRBO belongs to the HomeAway Family of companies among other companies such as VacationRentals.com, Bookabach, Stayz, Homelidays, Abitrel HomeAway, Alugue Temporada, Toprural, and FeWo-direkt. In addition, the VRBO home page notes that “VRBO” and “Vacation Rentals by Owner” are registered trademarks of HomeAway.com, Inc. The VRBO website address further indicates that VRBO is under HomeAway.com, Inc.
3. What is the difference between VRBO and Airbnb? VRBO and Airbnb are independently owned and operated vacation rental brands. As noted in Question 2 above, VRBO is one of the brands under the HomeAway family of brands. According to the HomeAway About Us page, HomeAway is part of the Expedia Group Family of brands. HomeAway was founded by Brian Sharples and Carl Shepherd in February 2005. On the other hand, Airbnb was founded in 2008 by Brian Chesky, Joe Gebbia, and Nathan Blecharczky as noted on the Airbnb About Us page. 4. How do I get my VRBO.com refund? One of the most common VRBO complaints is in regards to the VRBO refunds policy. 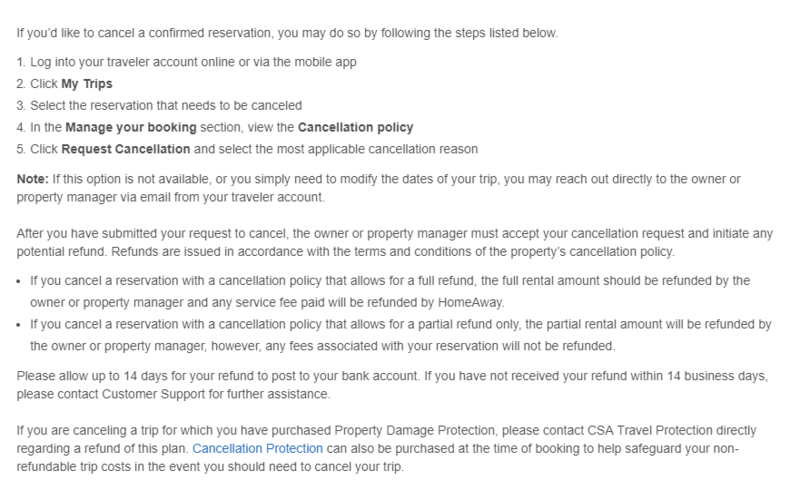 To cancel your reservation and request a refund, HomeAway provides a detailed procedure in a video on their help page. Log in to your account and go to “My trips”. Select the specific reservation you would like to cancel. You will be presented with a VRBO cancelation policy. 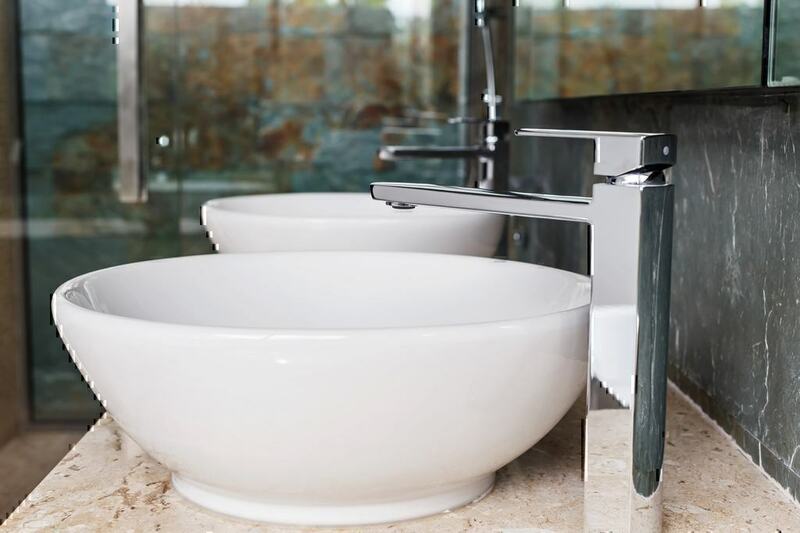 Usually, the VRBO refund policy is at the property owner’s discretion, therefore, cancellation policies may differ from one property to another. According to VRBO FAQs, once you have reviewed the cancelation policy, click on the select cancellation button. You will be asked to provide a reason for your cancellation and the cancellation request will be submitted to the property owner. The property owner will then accept the cancellation and initiate any potential refund depending on the terms of the cancellation policy of the specific property. Refunds can take up to 14 days to reach your bank. If you have not received your refunds after 14 working days, get in touch with VRBO customer help for further assistance. In the case that you are canceling a trip for which you had purchased property damage protection, get in touch with CSA Travel Protection to seek a refund and you could get a full one. VRBO Customer Help Centre states that refunds can take up to 14 days to reach your account. If you haven’t received your refunds or if you have any questions about the damages deposit, get in touch with the property owner. 5. How to leave a review on www.VRBO.com? VRBO and HomeAway offer a two-way review system where travelers and owners can rate their experiences after the traveler’s stay is completed. HomeAway provides specific guidelines for leaving reviews including content guidelines and eligibility to leave a review. For instance, a traveler must have stayed at a VRBO property and must provide evidence thereof to leave a review; property owners cannot review their own properties; reviews should not disclose the specific location of the property and the amount charged; and the review must be submitted within a year of your stay among others. 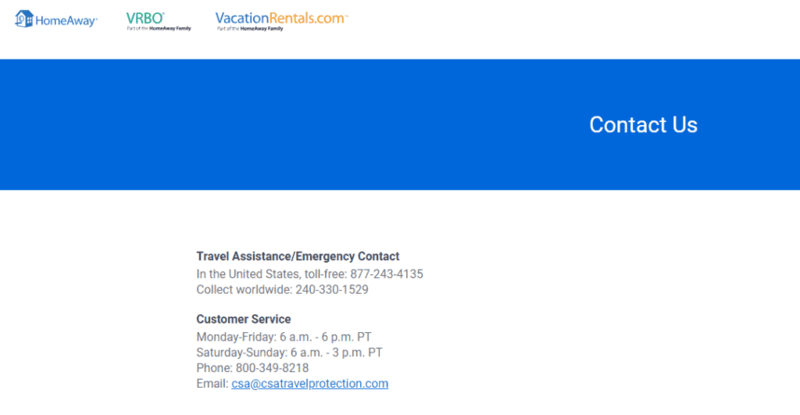 Below is the procedure provided on the HomeAway help center on how to leave a review:"
Log in to your traveler account using the email address used to book the property. Select your specific reservation from past trips. Click Leave a Review which can be found in the top portion of your trip. Alternatively, once you check out of the VRBO/HomeAway website after your stay, you will receive an email containing a link to a page where you can submit your review on whether or not you enjoyed your stay, and to give a star rating of your overall experience. Once you have submitted your review you will receive a confirmation email with a copy of your review and your review ID. 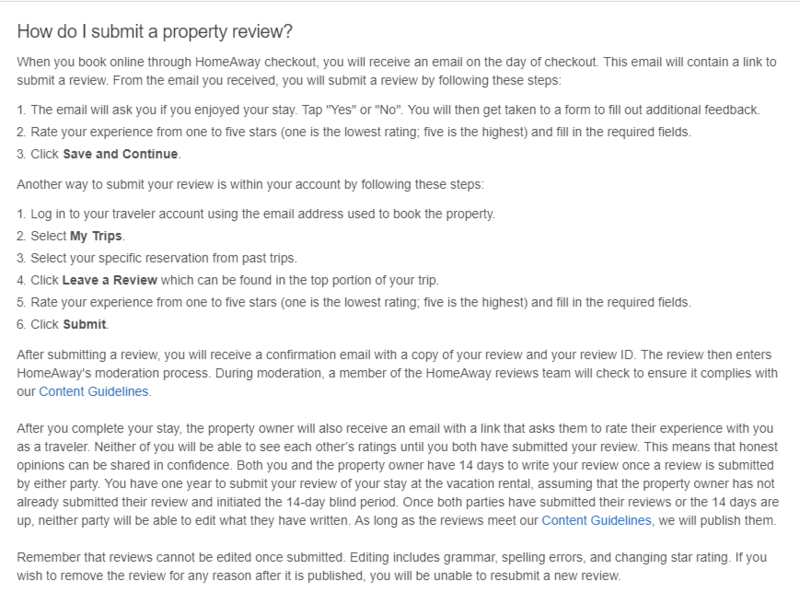 Your review will then go through the HomeAway reviews moderation process to ensure it complies to the guidelines. Your property owner will also be required to submit a review for both of your reviews to be published. Once you have submitted your review you cannot be able to edit it. With that said, according to a Homeaway/VRBO video review on PissedConsumer, it is frustrating that travelers who have had their reservations canceled unexpectedly and without any reason from the property owner cannot post a review on their experience to HomeAway. In such a case, there are other other platforms available where you can post your review including VBRO reviews page on Pissed Consumers and VBRO social media pages. 100% of your security deposit is covered if it is wrongfully withheld. Protects 100% of your payment against things like listing fraud, phishing, significant property misinterpretation, wrongful denial of entry or uninhabitable property upon arrival. However, many VRBO complaints on PissedConsumer reveal that VRBO/HomeAway have not always kept their word on the “Book with Confidence Guarantee”. Some customers have encountered instances where their reservations were canceled for no good reason, the property was misrepresented, a property was inhabitable upon arrival, or they were assisted with emergency booking. Here are some VBRO reviews from PissedConsumer. In this example, the reservation was canceled by the owner without reason and a refund has not been made yet. “I had booked a reservation in May which got canceled by the owner. VRBO was supposed to process a reimbursement which they state they did. Homeowners have also made complaints about VRBO. 7. How to remove the listing from VRBO.com? According to the VRBO customer help center, you can have your property listing removed by contacting the VRBO customer care. However, if you want your listing to be unavailable temporarily, you can opt to hide it and unhide it at a later date. 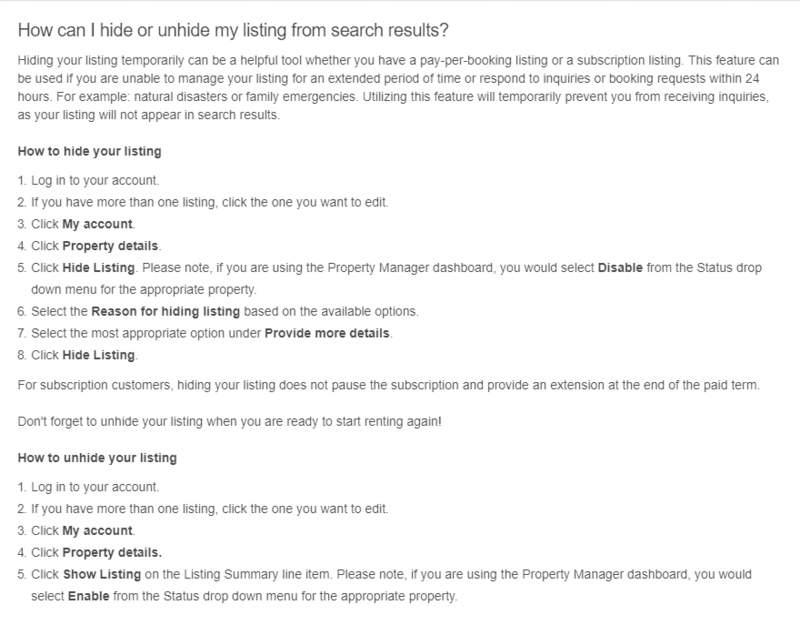 Here is the procedure provided on the VRBO Help Centre for hiding and unhiding your listing. Please note that for subscription customers, hiding your listing does not pause your subscription. On the other hand, property owners that choose to have their listing permanently removed before the end of a subscription will not be refunded. 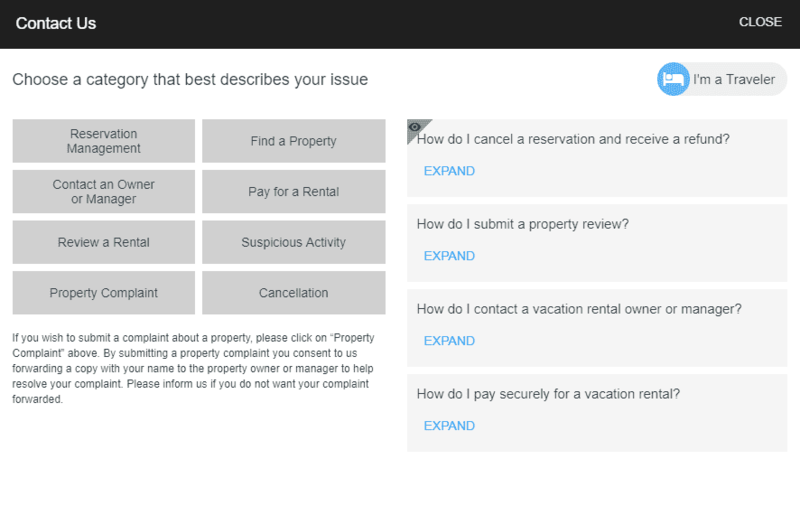 Do you have a VRBO complaint or question that is not addressed above? Leave a review on VRBO reviews page on PissedConsumer. Get in touch with VRBO customer care. Go through the VRBO help center to find answers.